Russia has set out plans to increase its military procurement over the next three years and commission 70 new strategic nuclear missiles. A government official said there would also be more short-range missiles, combat planes, helicopters, tanks and naval vessels. In all, Russia will spend nearly $140bn (£94.5bn) on buying arms. Higher oil revenues in recent years have allowed the Kremlin to increase the military budget, analysts say. The move comes months after the war with Georgia, which exposed problems with outdated equipment and practices within Russia’s armed forces and led to calls for military modernisation. The comments came from Vladislav Putilin, whose department oversees weapons industries, after a government session chaired by Prime Minister Vladimir Putin. “More than 70 strategic missiles will be bought and delivered to troops in the next three years, more than 30 short-range Iskander missiles and a large number of booster rockets and aircraft,” Interfax news agency quoted him as saying. The military would also purchase 14 naval vessels, 48 combat jets, more than 60 military helicopters and almost 300 tanks, he added. The move comes amid tensions with the US over its plan to deploy elements of a missile shield in Eastern Europe. Last month President Dmitry Medvedev said Russia would deploy short-range Iskander missiles in Kaliningrad, a Baltic enclave near Nato member Poland, if the US went ahead. The Russian military will commission 70 strategic nuclear missiles over the next three years, a senior government official said Monday, according to Russian news agencies. The statement by Vladislav Putilin, a deputy head of the Cabinet’s military-industrial commission in charge of weapons industries, indicates the government’s intention to significantly increase the tempo of rearming Russia‘s Strategic Missile Forces. 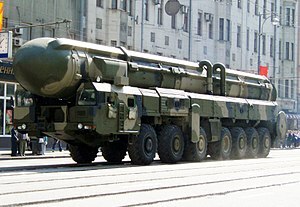 Since the late 1990s, Russia has commissioned more than 50 new Topol-M intercontinental ballistic missiles at a pace of several missiles a year. Soviet-built nuclear missiles continue to account for the bulk of Russia’s strategic nuclear forces, and the military has repeatedly extended their designated lifetime to maintain the nation’s nuclear deterrent. Putilin, who spoke after a government session chaired by Prime Minister Vladimir Putin that discussed the weapons purchases, said the Cabinet has decided to spend about 4 trillion rubles, or $141 billion, on new weapons over the next three years, Interfax and RIA Novosti news agencies reported. Putilin said that in addition to 70 strategic missiles, the military will also get 30 short-range Iskander missiles, 48 combat jets, 60 military helicopters, more than 300 tanks and 14 navy vessels in the next three years. Putin urged Cabinet officials Monday to quickly transfer the funds allocated for the military-industrial complex and closely control the quality of new weapons and pace of their production. Russia’s oil bonanza allowed the Kremlin to continuously boost military budgets during Putin’s eight-year presidential tenure, but Soviet-built weapons have remained the core of the nation’s armed forces. Experts have warned that the Kremlin’s goals of military modernization may now be stymied by the nation’s economic crisis. You are currently browsing the archives for the nuclear missiles category.